For the women's tournament taking place at the same time, see 2009 ICC Women's World Twenty20. The 2009 ICC World Twenty20 was an international Twenty20 cricket tournament which took place in England in June 2009. It was the second ICC World Twenty20 tournament, following the inaugural event in South Africa in September 2007. As before, the tournament featured 12 all-male teams – nine of the ten Test-playing nations and three associate nations, which earned their places through a qualification tournament. Matches were played at three English grounds – Lord's and The Oval in London, and Trent Bridge in Nottingham. The tournament was organised in parallel with the women's tournament, with the men's semi-finals and final being preceded by the semi-finals and final from the women's event. The final took place at Lord's on Sunday 21 June with Pakistan beating Sri Lanka by eight wickets and England beating New Zealand by six wickets in the women's final. In June 2006, The Daily Telegraph reported that the Marylebone Cricket Club and Surrey CCC had put in a joint bid to host the tournament at Lord's and The Oval. In December 2007, the ICC provisionally approved a Women's World Twenty20 to run alongside the men's event which, subject to the approval of the ICC's finance and commercial affairs committee, would come into effect for the 2009 tournament in England. In early January 2008, speculation arose that the tournament could be held elsewhere as the British government have banned Zimbabwe from touring England in 2009. However, it was later confirmed that the tournament would definitely take place in the country. In April 2008, the third venue was confirmed as Nottingham's Trent Bridge; the 17,500 seater stadium was chosen to hold one of the semi-finals, among other earlier matches. Lord's and The Oval are the two other confirmed venues, with the opening match and final being played at Lord's. Old Trafford Cricket Ground had bid for the third venue, but Trent Bridge was chosen for its closer proximity to the two London grounds. Although early reports suggested the 2009 event may involve just eight teams in a nine-day event, the full twelve-team tournament was confirmed, featuring the Test-playing nations and two qualifying associate nations. However, in July 2008 Zimbabwe, under pressure from South Africa and England over political matters related to Robert Mugabe, pulled out of the tournament of their own volition, creating an additional space for an associate nation. Qualification was achieved by the finalists of an ICC World Twenty20 Qualifier held in Belfast from 2–4 August 2008, between Kenya, Scotland, Ireland, Netherlands, Canada and Bermuda. Ireland and the Netherlands, having reached the final, qualified outright, while Scotland won the third place playoff beating Kenya to also qualify. In case of a tie (i.e. both teams score exactly the same number of runs at the end of their respective innings), a super-over decides the winner. This is applicable in all stages of the tournament. If still equal, result of head to head meeting. The groups were announced on 31 October 2007, based on finishing positions at the 2007 ICC World Twenty20 and the successful qualifying associate nations. The initial four group format is the same as that used at the 2007 tournament. Team seed in brackets. All times shown are in British Summer Time (UTC+01). Bangladesh won the toss and chose to bat. Chairman's XI won the toss and chose to field. New Zealand won the toss and chose to field. Ireland won the toss and chose to bat. Scotland won the toss and chose to field. Netherlands won the toss and chose to field. PCA Masters XI won the toss and chose to field. Bangladesh won the toss and chose to field. New Zealand won the toss and chose to bat. Scotland won the toss and chose to bat. Australia won the toss and chose to bat. Netherlands won the toss and chose to bat. India won the toss and chose to field. South Africa won the toss and chose to bat. South Africa won the toss and chose to field. West Indies won the toss and chose to bat. Pakistan won the toss and chose to bat. Ireland won the toss and elected to field. Bangladesh were eliminated, India and Ireland qualified for the Super 8s as a result. Rain prior to the match delayed the start and shortened the game to 18 overs a side. Netherlands won the toss and elected to field. England go through to the Super 8 stage as a result of this match. Mohammad Amir (Pak) made his T20I debut. Netherlands were eliminated, Pakistan go through to the Super 8 stage as a result of this match. Australia won the toss and elected to bat. Sri Lanka won the toss and elected to field. Australia were eliminated, Sri Lanka and the West Indies advance to the Super 8s as a result. New Zealand won the toss and elected to field. Match reduced to 7 overs per side. Scotland won the toss and elected to field. Scotland were eliminated, South Africa and New Zealand go through to the Super 8 stage as a result. The Super 8s consisted of two groups: Group E and Group F. Group E consisted of A1, B2, C1, D2 and Group F consisted of A2, B1, C2, D1, where X1 is the first seed from Group X and X2 is the second seed from Group X. The seedings were based on performance in the last ICC T20 (2007). If a non-seeded team knocks out a seeded team, the non-seeded team inherits the seed of the team it knocked out. West Indies won the toss and elected to field. South Africa qualified for the semi-finals and India were eliminated as a result of this match. Rain revised the West Indies' target to 80 runs from 9 overs according to the Duckworth–Lewis method. West Indies qualified for the semi-finals and England were eliminated as a result of this match. Umar Gul became the first bowler to take five wickets in a Twenty20 international. Shahzaib Hasan (Pak) made his T20I debut. Ireland were eliminated as a result of this match. Pakistan qualified for the semi-finals as a result of this match. Sri Lanka qualified for the semi-finals and New Zealand were eliminated as a result of this match. Dilshan scored 60.76% of Sri Lanka's runs, which was a new Twenty20 International record. However, this only stood for a matter of hours, as Chris Gayle scored 62.38% of West Indies' total. Lasith Malinga bowling from the Nursery End in the Final at Lord's. In the final at Lord's, the home of cricket in London, Sri Lanka won the toss and elected to bat. The first over was bowled by Mohammad Amir. 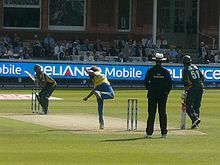 After failing to score off the first four balls – all short – Dilshan went for his scoop and mistimed it, resulting in him being caught at short fine-leg. Soon after this, Jehan Mubarak top edged a delivery by Abdul Razzaq which went high in the air and was caught by Shahzaib Hasan, leaving Sri Lanka at 2 for 2. Sanath Jayasuriya was able to stabilise the innings for Sri Lanka hitting 17 runs off 10 balls, however, Jayasuriya soon fell as he dragged a good length ball back on to the stumps. Mahela Jayawardene followed after edging a shot into the hands of Misbah-ul-Haq, leaving Sri Lanka on 32/4. Sangakkara and Chamara Silva added further runs, before the latter was caught by Saeed Ajmal playing a pull shot off the bowling of Umar Gul. Shahid Afridi soon after, took the wicket of Isuru Udana with a googly which drifted into the right-hander, knocking the off-stump. This brought in Angelo Mathews, who along with Sangakkara took the score from 70/6 to 138/6, with 17 runs being scored off the last over bowled by Mohammad Amir. Sri Lanka finished on 138/6 from 20 overs. Pakistan started off well with openers Kamran Akmal and Shahzaib Hasan adding 48 run for the 1st wicket, before Kamran Akmal was stumped by Kumar Sangakkara by the first delivery of Sanath Jayasuriya. Pakistan reached the target in 18.4 overs, with Shahid Afridi, who hit the winning runs, earning Man of the Match while Tillakaratne Dilshan was declared Man of the Series for his 317 runs at an average of 63.40. Pakistan's win, often cheered on by crowds of fans from England's Pakistani communities, marked its first world title since Imran Khan's "cornered tigers" had won the 1992 World Cup. ^ "T20 World Cup 2009". cricketwa. Archived from the original on 23 December 2015. Retrieved 22 December 2015. ^ "ICC events". cricinfo.com. Retrieved 25 August 2016. ^ "Pakistan power to Twenty20 glory". BBC Sport. 21 June 2009. Archived from the original on 22 June 2009. Retrieved 22 June 2009. ^ Atherton, Mike (21 June 2009). "Katherine Brunt leads England to World Twenty20 title". The Times. Times Newspapers. Retrieved 21 June 2009. ^ a b "Pakistan crowned new world Twenty20 champion, crushes Sri Lanka by 8 wickets". International Business Times. 21 June 2009. Archived from the original on 24 June 2009. Retrieved 24 June 2009. ^ "FINAL: PAK vs SL: Blow by Blow". ESPN Star. 21 June 2009. Archived from the original on 25 June 2009. Retrieved 24 June 2009. ^ "Pakistan v Sri Lanka". Teletext. 21 June 2009. Retrieved 24 June 2009. ^ "ICC World T20 Final: Sri Lanka vs Pakistan". ESPN Star. 21 June 2009. Archived from the original on 25 June 2009. Retrieved 24 June 2009. ^ "Shahid Afridi". ESPN Star. 21 June 2009. Archived from the original on 29 June 2009. Retrieved 24 June 2009. Miller, Andrew (4 June 2009). "Bringing the monster back home". CricInfo. ESPN. Archived from the original on 7 June 2009. Retrieved 18 June 2009.